Italy is a very special place. I'm not the first one to discover that. Chess obviously is not the number one thing that comes to mind when thinking about this beautiful country. Rather, it would be: The incredible architecture, arts, music, great food and wine. All of the above, and much more, had a great impact on my artistic and personal life. 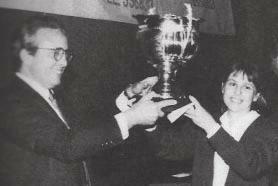 In my chess career the most memorable achievement was the 'Magistrale di Roma' in 1989. This event is a record in chess history as compared to any other open chess tournament, due to my performance rating of over 2900. 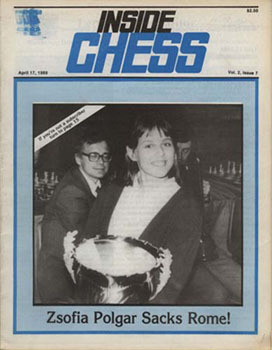 Most chess magazines worldwide had my photo on the front page with such titles as "The Sack of Rome" or "Miracle in Rome". I was only a fourteen year-old little girl upon arrival in Rome with a rating below 2300. Many of my opponents were respected grandmasters, three or four times my age. The first two games were against lower rated players then, in round three, I faced Palatnik a strong Soviet GM. He was my first 'victim', followed by grandmasters Chernin (See game with annotations), Suba, and Razuvaev. Dolmatov was the one to 'save the honors' in the last round by playing the only drawn game against me in the tournament. The funny thing is, I didn't even realize how good I was doing until after the seventh round! It was a good thing I played move by move, game by game without thinking of the result or who was sitting on the other side of the board. The final score was an outstanding 8.5 out of 9 games. I've had a few other results I'm proud of in chess, but nothing comes close to that of Rome. Never before or after this tournament have I come close to such a performance.